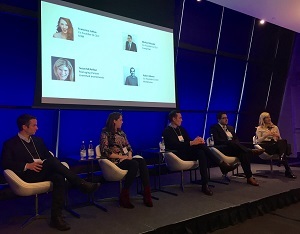 Property technology (proptech) has had a growing impact on the real estate industry in recent years, and representatives from five companies addressed their experiences at a breakfast event presented by Real Property Association of Canada (REALpac) and MetaProp NYC. MetaProp NYC runs accelerator programs, acts as an adviser and is the most active global investor in the PropTech space, having invested in more than 80 companies. Company partner Zak Schwarzman acted as the moderator of a discussion with executives from four other firms at Toronto Region Board of Trade’s East Lennox Hall on April 4. “All we do all day long is look to invest in technologies that will make your built environment more productive, efficient or sustainable,” said Susan McArthur, managing partner of Toronto-based Greensoil Investments and its five-year-old Greensoil Building Innovation Fund, which has eight PropTech companies in its portfolio. * and have an “agile, resilient and tenacious” leadership team. CompStak was founded in New York City in 2011 and is a crowd-sourced commercial real estate data platform specializing in lease and sales transaction data. It has a network of about 16,000 brokers, agents, appraisers and researchers who share information. This data is then sold through subscription access to commercial real estate investors and lenders including Wells Fargo, J.P. Morgan, U.S. Bank, Blackstone, BlackRock, TPG and Brookfield Asset Management (BAM-A-T), which use it to underwrite commercial investments and lend money on commercial real estate assets. CompStak co-founder and chief executive officer Michael Mandel said companies are generally much more willing to buy data than to share it, and he’s found sharing is more common in the United States than in Canada. Workframe, which launched in 2016, drives efficient, space-centred communication and decision-making across project teams on a single platform. It works with tenants, owners, brokerage firms, product managers and third-party service providers, all of which have their own unique work flows but have to come together to make things work when it comes to finding, designing and furnishing commercial and office interiors. hOM is a technology-enabled amenity provider that partners with residential and office properties to develop community by providing on-site fitness programming and unique events for tenants. It operates in Toronto and New York City and is looking to expand into other markets. hOM co-founder and chief executive officer Francesca Loftus said she wants to work with clients interested in exploring how they can maximize the data they get from hOM and expand on what hOM can provide. Mandel said large companies often “don’t do a great job of centralizing the decision-making” around working with PropTech firms, and CompStak sometimes needs separate contracts for different offices of the same company. McArthur emphasized the importance of having a C-suite champion in an organization who can look horizontally across a portfolio to make decisions on how best to deploy technology. Even with heightened concerns about data and security today, Loftus said she sees barriers coming down. While older companies want to keep their data to themselves, startups are open to partnerships and sharing to create a better set of living data. The more a PropTech company can offer to clients, Loftus said, the fewer privacy concerns the clients will have. McArthur stressed it’s important for companies to know what data they have, where they’ve shared it and how to get it back. She added it’s not very efficient from a return point of view to employ several people to research lease data and that it’s more productive to analyze it than it is to collect it. Mandel supports companies providing data to third parties like his, which he said can often do more interesting things with it, as long as there’s a protocol in place so they can withdraw it at any time so they’re not held hostage. He believes transparency of data across the real estate industry is good for everyone and that sharing deal transaction data makes for a more efficient and fair market. “Most sophisticated players are in it for the long term and want to make a fair deal and work with people over and over again,” Mandel said.